Need SEO for Real Estate? Talk to one of our experts. As one of the top real estate SEO companies in the world, we have developed a unique perspective on what works. Our real estate search engine optimization services begin with an audit and blueprint built around real estate keyword search terms and your website's pages. Real estate search terms are local in nature just as real estate for sale is local. Proper keyword research and analysis is at the foundation of our SEO services. There is a fine balance between keywords and competitiveness. Don’t just go after the search term with the largest search volume. We offer complimentary SEO audits at your request. These audits offer a good understanding of your website’s ability to rank, what you’re currently ranking for, and opportunities that might exist to improve ranking. Contact us today to schedule your free audit. Our success in Real Estate SEO speaks for itself with over 2,000 individual keyword searches with search volume indexing on page one for our clients. Element-360 has a unique approach to search marketing with 10 years of experience focusing solely on real estate businesses. With major real estate search engines dominating almost all markets for “Real Estate” searches (Zillow is ranking for over 6 million individual searches on the top 10 pages of Google), it has become increasingly more important to define your niche focus. This has advantages for both traffic volume and quality. We’ll run through some of the top ranking-factors and ways to get your real estate website ranked below. On-Page Factors: what’s on the page that people can see? Properly aligned page titles, meta descriptions, and heading tags some of the most important items when optimizing the page for users and bots. Google wants you to “Give visitors the information they’re looking for.” This is the best place where we do that. 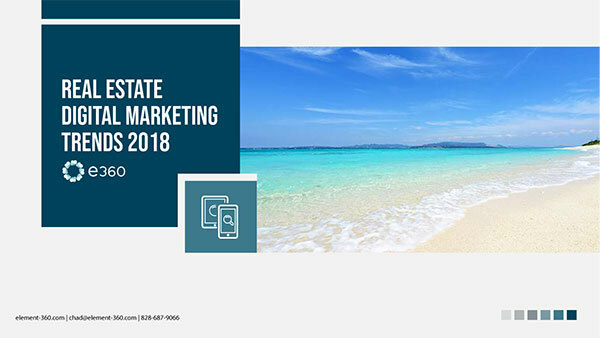 The best content for real estate businesses is the most up-to-date listings presented in a way that highlights what aspects users are looking for in their search. This includes property details such as beds, baths, square footage, price, and lots of photos. Additional helpful information can include information on neighborhoods, i.e. schools, population, relevant relocation resources, among others. Types of content include the actual media type that’s on your page and how it’s displayed. For example, text, bullet lists, images, videos, and maps are all different types of content. Different searches require different types of content to provide the user with the answer they’re looking for. Over optimization is a problem that was more prevalent in the past. Most new sites that we manage are under-optimized, though some older sites still utilize some of the optimization methods that no longer produce results. Proper tag lengths – these change from time to time as Google experiments; search around so you know what’s the best character length. Make sure to write an enticing page title and meta description to help boost up your click-thru-rate. Keyword stuffing – don’t just jam your keyword into the copy as many times as you can; Google can detect unnatural language. Meta keywords tag – don’t even touch it. Technical SEO: what do bots care about most? Technical SEO covers a wide range of topics and considerations. For this portion, we’ll only cover the basics. Site speed – under 3 seconds on an unthrottled connection and you’re good. Secured site – make sure you’re on SSL or HTTPS. Mobile friendly – many factors bake into this; use a testing tool to make sure. Canonical & meta robots tags – this is how you tell Google which URL is correct, block pages from indexing, and so on. Crawlability – is all your content available to text crawlers? Check the cache or use a text browser. Schema & Structured data – mark up your page with as much of this as applicable; social tags, reviews, etc. Your business is an Entity to Google, or at least it should be. Citations and link building help Google recognize that your site is a trustworthy source of information. Citations – mentions of your business / brand name and typically include name, address, and phone number as well as links to your site on Google my business and related business listing directories. Link Building – links to your website from others. Correcting Penalties & Pseudo-Penalties – It’s a zoo in here! Looking for more info on SEO in general? Feel free to reach out and schedule some time for an audit!